Parts of speech are groups of words with similar syntactic functions of common lexical or grammatical meaning. 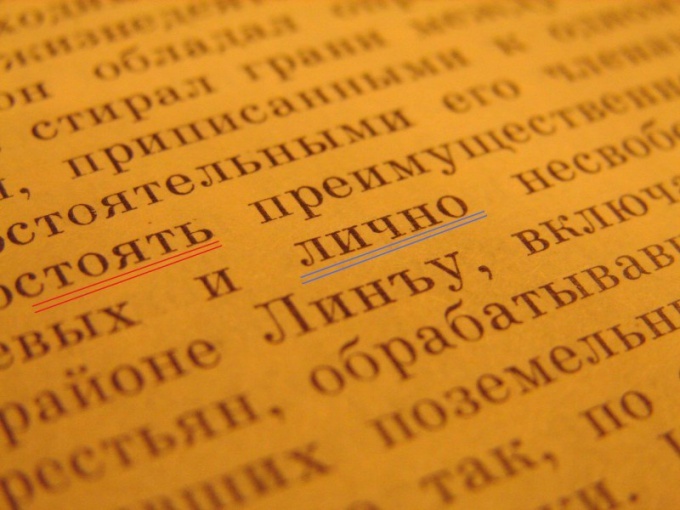 In Russian, there are 10 major classes of speech units. To determine the identity of the word to a particular part of speech, you need to remember a few simple recommendations. - a pen or pencil. Write the word on a separate sheet of paper. Locate the original form of the word, for example, "document – document", "beautiful – beautiful", "eat – eat", etc. Think about what it means. In Russian language the word can call animate and inanimate objects, and describe the properties and qualities of the objects to indicate the action and the amount. These language elements are called the independent parts of speech. These include: noun, adjective, verb, pronoun, name, numeral, adverb. The second group consists of auxiliary parts of speech. They do not call and do not characterize the objects, characteristics, actions. Words in this group serve to ensure the integrity of expression that give meaning and emotional value propositions. Service parts of speech are prepositions, conjunctions, and particles. 1. Who? What? – a noun. This part of the question refers to the subject. For example: the joy, the word, people. 2. What? Whose? What? – adjective. Indicates a feature of an object. For example: funny, Fox, winter. 3. What to do? What to do? What does? What can you do? What would I do? What did you do? Did? – the verb. Calls the action happening to the subject or produce them. For example: draw, build, write. 4. How much? Which? What kind of account? - the name of the numeral. Indicates the number, the sequence number of an object or the total number of items. Example: two hundredth, three. 5. How? Where? When? Where? Why? Why? – adverb. This is a variable part of speech that describes a characteristic action or characteristic trait. For example: carefully, carefully, expertly, barely sensible. 6. Who? What? Which? – pronoun. This part of speech replaces nouns, adjectives, numerals. The pronoun points to the object, a sign or number, but does not name them. For example: I, you, he, this, who, themselves, our, many. 1. The preposition used to link words in phrases and sentences. For example: in, on, out, over, from, after, besides. 2. Union connects homogeneous members of the sentence and parts of complex sentences. For example: and, but, or, so, because, when, since. 3. Particle makes to offer additional value (negation, question, doubt, etc.). For example: really, even, just, no, Lee. 4. Interjection. These immutable in form of words are used to convey emotion, expressions of strong feelings. For example: Oh, Oh, Oh, Oh.